The new generation of sine wave inverters, Steca Solarix PI 500-12 Off-Grid Solar Inverter 500W 12V, demonstrates robustness. Existing safety features have also been made more customer-friendly and robust. The new generation of the Steca Solarix PI possess different technical properties to predecessor models and may not be suitable to replace these. 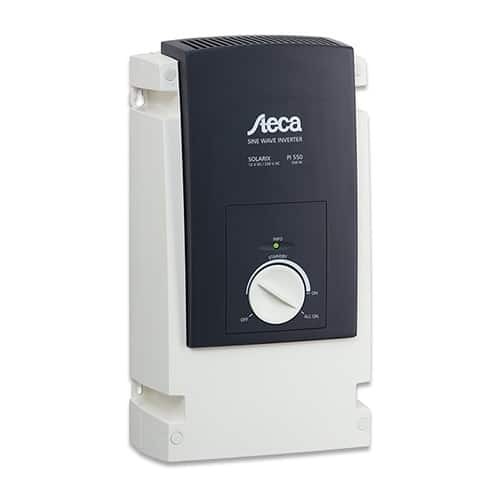 In developing the Steca Solarix PI 500-12 Off-Grid Solar Inverter 500W 12V sine wave inverter, Steca has brought about some innovations. In particular these include the ability to connect all Steca Solarix PI models in parallel, the innovative operating concept using a single rotary switch and the electronic fuse. Furthermore, many years of experience have come into play for deploying these inverters specifically in photovoltaic systems. This comes through, for instance, in the way that a most diverse range of appliances is provided with a low operating consumption and a stable energy supply.